Despite his unknown whereabouts, the mysterious Maltese professor who sparked the Mueller investigations is now in hot water with former employers. 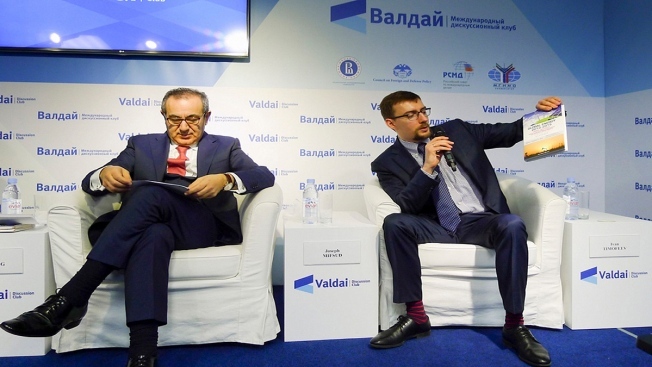 In this handout photo taken on April 19, 2016, released by Valdai Club foundation, shows Ivan Timofeev, right, and Joseph Mifsud, attend the Valdai Discussion Club Conference following the results of the closed-door Iran-Russia discussion in Moscow, Russia. No one seems to be able to find Joseph Mifsud, the Maltese academic at the center of the Russia investigation rocking Washington, but his legal woes are piling up on both sides of the Atlantic. On Tuesday, an Italian court ordered the missing 58-year-old to hand back more than 49,000 euros ($56,700) in overpayments from the University Consortium of the Province of Agrigento, a Sicilian institution of higher learning where he once served as president. But the 27-page judgment gave few clues as to Mifsud's current whereabouts, which have been the subject of increasingly intense — and outlandish — speculation. "Residence unknown," is what the judgment gives as Mifsud's address. It details fruitless attempts by Italian authorities to find Mifsud at an apartment in Rome, his former campus and in London. Mifsud, a once-obscure Maltese academic who holds a doctorate in comparative education, shot to international prominence after he was identified as the mysterious professor who told Trump campaign adviser George Papadopoulos that the Russians had "dirt" on Hillary Clinton in the form of "thousands of emails" during an April 2016 meeting in London. Declassified memos authored by U.S. lawmakers show that it was this meeting that eventually triggered the FBI's counterintelligence investigation into potential coordination between Russia and the Trump campaign. That probe was later taken over by special counsel Robert Mueller, who on Friday scored his first sentencing of a Trump campaign aide when Papadopoulos was ordered to spend 14 days in prison for lying to the FBI about his contacts with Mifsud and others. But while Papadopoulos and others have hit the media circuit to defend themselves in the court of public opinion, Mifsud has gone to ground. Journalists have been unable to locate him. His former associates say they have no idea where he is. In a court filing in New York last week, the Democratic National Committee — which is suing Mifsud, among many others, over the theft of thousands of emails by Russian hackers in the heat of the 2016 election — said that the academic "is missing and may be deceased." There was no hint of that in Tuesday's judgment, which was prepared in advance and handed down by the Court of Auditors in the Sicilian port city of Palermo. But if Mifsud had shown up in court, he might have saved himself some money: his two co-defendants got off on a technicality.